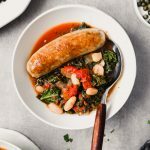 Healthy, hearty and easy to make, these Italian chicken sausages simmered with tomatoes, white beans and kale are perfect for feeding a hungry family. Combine ½ cup beans, ½ cup tomatoes, reserved tomato juice and chicken broth in the bowl of a food processor; purée until smooth, about 30 seconds. Heat oil over medium heat in a Dutch oven until shimmering. Add sausages and brown on all sides, about 8 minutes; transfer to a plate and set aside. Add onion to fat left in pot and cook until softened, about 5 minutes. Stir in garlic, Italian seasoning and pepper flakes and cook until fragrant, about 30 seconds. Stir in puréed bean mixture and cook 1 minute, scraping up any browned bits. Stir in kale, remaining tomatoes, and ¼ teaspoon salt. Bring to a simmer then reduce heat to medium-low, cover, and cook, stirring occasionally, until kale is wilted and tender, about 15 minutes. Stir in remaining beans and nestle sausages into pot; adding any accumulated juices. Cover and cook until sauce is slightly thickened and sausages are heated through, about 10 minutes. Season with salt and pepper and serve. In addition to using the Dutch oven, I also like to use my cast-iron enameled braiser for this recipe. You can also use a large pot. Use any broth or stock you have on hand (if you don’t have any, you can use some water, just be sure to season more heavily with salt).